Villa Als Marmarei, soul relaxing infinity. With a breathtaking view of the endless blue sea, ALS MARMAREI was built to reflect the aesthetic principles of Feng Shui philosophy in the natural stone colors. It also adopted the plain and elegant forms of Cycladic architecture in order to match the environment and to embrace the visitor, revealing the energy of the place as a point of direct contact with him. The cluster of the cottages is situated on the east coast of the island, nestled on the top of a hill next to a wild canyon, overlooking the blue sea and eleven other islands: Andros, Tinos, Giaros, Siros, Mykonos, Serifos, Siphnos, Kithnos, even Paros and Naxos and Evia in the far left. Two of Kea’s best beaches, Sykamia and Kalidonihi, with their crystalline waters and Cycladic stone lapped by the sea, are very easily accessible. The ALS MARMAREI complex is contained within a 5 ½ acre area. A kidney shaped swimming pool is situated in the middle of the grounds. From every point of the estate, guests can gaze at the soul-relaxing blue Aegean that liberates both the mind and the soul. Thanks to the constant boat crossing in the sea roads stretching ahead, the visitor enjoys an ongoing seascape. Throughout the property, there are olive, pomegranate, almond and fig trees, as well as aromatic herb plants, blossoming flowers and a small vineyard. An ancient restored granary, dating from the 19th century, the jewel of the property, that oversees the infinite blue, is near the cottages. All cottages have large terraces with a spectacular view of the sparkling sea. At ALS MARMAREI, guests will enjoy, in privacy, unsurpassed views of the sunrise, passing ships and the omnipresent blue sea. The five cottages offer fresh towels and sheets, as well as a brand new fully-equipped kitchen with modern appliances. Among the facilities, the cottages feature refrigerators, stoves, dishwashers, microwave, coffee machines, espresso maker, toaster, electric water heater, kitchen utensils, washing machines, CD players and Jacuzzi. The beds have anatomically- friendly mattresses of excellent quality and the windows and balcony doors have screens to keep out insects. While usually unnecessary due to excellent natural ventilation, even in the summer hottest days, all rooms have ceiling fans and, in the winter, central heating is provided. On the verandas, there are bamboo sofas, tables with fitted chairs, a built barbecue, a big hand-made table which can host about 16 guests. Other amenities include a spacious parking area, an outside shower, deck chairs and umbrellas complimenting the pool area. A caretaker lives on the premises and can provide immediate assistance at any time. Cleaning and linen changing services occur twice weekly. For those wishing to order prepared meals, a menu will be provided but this will involve extra charges. I am a person that loves communication, arts, travelling, discovering places, people and new unique experiences. I love children, animals, nature and everything is original, simple and beautiful. I like yoga and meditation, reading, cycling, sailing. I am a writer. I used to write comedies for the television and now novels and plays. I used to be lower, I stadied international low in Brussels, I worked for years at the Hellenic tourist organization and I have my Phd in tourism, in the sector of protection of consumer. I believe in friendship, the beauty of life but above all in the power of human spirit! We have been fascinated by the place: a hill next to a wild canyon, overlooking the blue sea and eleven other islands.It is a magic place that relaxes the soul and the spirit, very close to the island’s two best beaches, Sikamia and Kalidonihi. The amazing views of the sunrise and the other Cycladic islands with the blue Mediterranean ever constant The wild nature that relaxes the spirit and the soul The nearby spectacular beaches The architecture of our villa is based on the positive energy aesthetics of Feng Shui which insures hospitality to the guest along with sensations of peace, pleasure and a union with nature Because it is a paradise for hiking lovers. A place with wild and untamed beauty The access to Kea island from Athens airport is very easy. It is only 30 min by bus or taxi to Lavrio port. The taxi costs about 40 euros. Then it is one hour by ferry to the island (about 11 euros per person) There you have to rent a car in order to discover Kea. From the port of Kea to our villa is half an hour drive. At ALS MARMAREI, the visitor will discover solitude and be at one with nature. Beautiful beaches, hiking trails, unique archeological sites, attractive restaurants in the capital Ioulida (15 minute drive), water sports in Koundouros (30 minute drive), as well as more restaurants and nightlife at the Port and Vourkari. Gorgeous place! Great hospitality. You feel surrounded by comfort in a minimal and elegant environment. You cannot but adore the sky and stars. You have the opportunity to get closer to the person you love and become endlessly romantic. 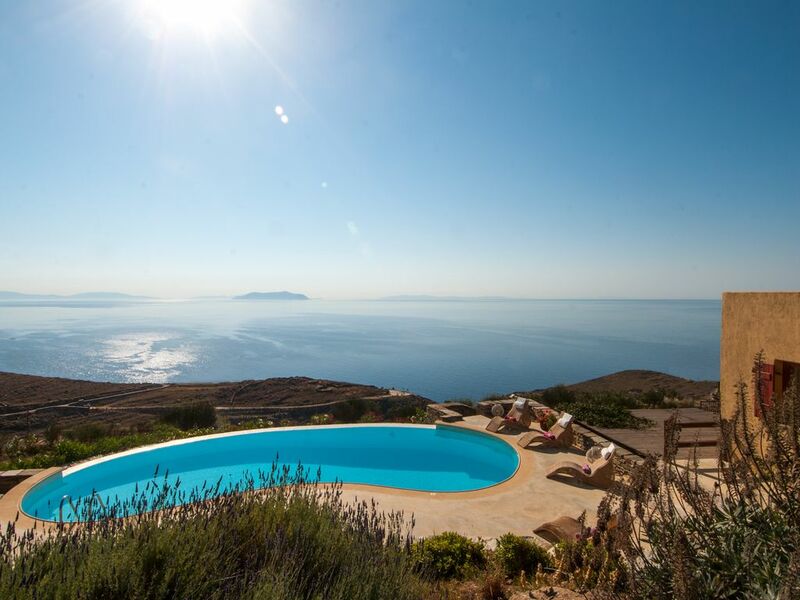 Breathtaking views to the sunrise, the infinite blue and 11 other cycladic islands. ALS MARMAREI is situated on Kea’s east coast, in the Sikamia area, where the island’s best beaches are found. Nestled on a hill, overlooking the endless sparkling sea, the landscape around is wild and hospitable at the same time, typical of the Cycladic islands. Besides the breathtaking view, there is a canyon with oleanders and almond trees en route to the sea, that is very impressive. Sighting eagles, grouses, rabbits and many other species of wild birds is common, as well as encounters with horses, goats and donkeys from local farms. In this rustic setting, you will inevitably and easily blend with nature. Using ALS MARMAREI as a base you can discover the unique beauties of Kea, that is a different and slightly mysterious island, cosmopolitan, serene and peaceful at the same time, famous for its antiquities, its oak forest and wild flowers, its fabulous beaches and above all its ancient paved paths. ideal for treching, a paradise just one hour from Athens. Please contact us for options for a fewer number of guests.